An unprecedented hunger strike by 750 of the 1,200 detainees in Tacoma’s Northwest Detention Center started during breakfast on March 7. 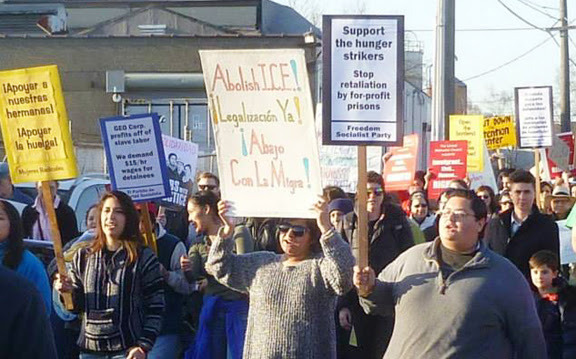 The strikers’ demands for an end to deportations and inhumane conditions in the privately-owned prison has made national headlines and drawn broad community support. On March 17 the strike spread to the Joe Corley Detention Center in Conroe, Texas. Both jails are run by the GEO Group, Inc., this country’s second largest for-profit prison corporation. 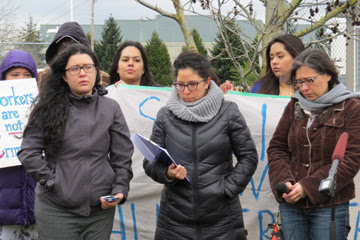 AT A MARCH 19 PRESS CONFERENCE in front of the Tacoma detention center, Maru Mora Villalpando of #Not1More began by saying, “Obama can stop the deportations, but he has chosen not to.” She introduced several family members of the hunger strikers, who explained that their husbands andt were taking this action to expose the abuses in the detention center and to stop the deportations. One of the strike leaders, Jose Moreno, who had just been released, spoke on behalf of those inside, saying that mistreatment by officials, as well as poor food and medical care are among the abuses the strikers are protesting. 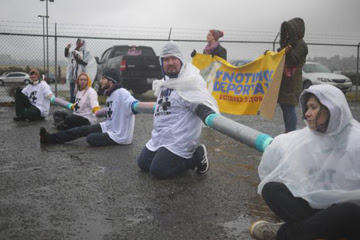 ACROSS THE COUNTRY undocumented immigrants, especially women, youth and detainees, are putting their bodies on the line to demand an end to endless deportations. It is a dramatic change from the go-slow “comprehensive immigration reform” (CIR) strategy promoted by immigration reform organizations closely tied to the Democratic Party. “The CIR trade-off — giving up immigrants’ civil and labor rights to get legalization — has always been an unworkable strategy for immigration reform. The CIR bills serve the interests of employers. Whether they’re looking for farm workers, construction workers or high tech workers, the corporate objective is to ensure that wages go down as workers compete for insecure jobs. 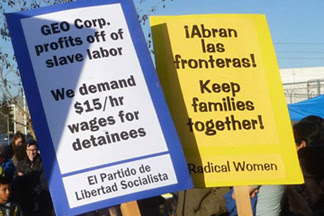 SIGN the online petition to support the hunger strikers at the Northwest Detention Center. PARTICIPATE in the National Day of Action against deportations being planned across the country for April 5th. There will be a rally at the Tacoma detention center that day from noon to 5:00pm. Anyone interested in carpooling from Seattle, please contact the Freedom Socialist Party at FSPseattle@mindspring.com. Learn more about the national campaign at notonemoredeportation.com. JOIN the #Not1More protests in front of the Northwest Detention Center that take place every day from noon to 5:00pm leading up to the April 5 rally. Late breaking news: On Monday, March 24th 70 detainees in Tacoma rejoined the hunger strike.